Our new 10” black, white and natural finish un-assembled wood clock making kits are substantial wall clocks, and so easy to personalize. Each kit comes with a white Arabic 9-5/8” dial printed on 80 pound cardstock paper a movement and clock hands. You can use it as is, and glue photos in the center, or use the blank back of the dial to do whatever you would like. It’s an open canvas. You can even print you own dials out and use this dial as a template for cutting your own. Lots of possibilities to personalize! We continue to grow our Clock Craft Kits in order to provide you with a number of exciting options. We also have an annual contest in which you can enter your project. You may want to consider one of our other clock kits for your next project. 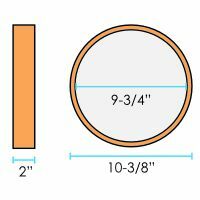 The all wood case is actually 10-5/16 inches in diameter and nearly 2 inches deep. Just the front edge is 3/8” thick. This substantial wall clock case is available in a Matte Black, Matte White or Natural Wood Finish. Re-paint it another color if you would like. The thick plastic lens is covered with a protective coating on both sides so you are guaranteed to have your clear lens in perfect condition when you assemble your wall clock. Assembly is simple and can be done in just a couple of minutes. Glue your dial to the front of the heavy plastic backer, and install the AA battery powered quartz movement on the back. This is a top quality AA battery powered continuous sweep silent motor. It’s great for bedrooms or reading rooms where silence is important. All 3 clock hands just “press-on”. Slide the clear lens then backer into the back of the wood case. Install the 4 self-tapping wood screws in the retaining tabs on the back of the plastic backer and you’re done.